With holiday shopping in full swing, many parents are looking for the best toys out there. How do they know what to buy? What is safe? What toy is the best? 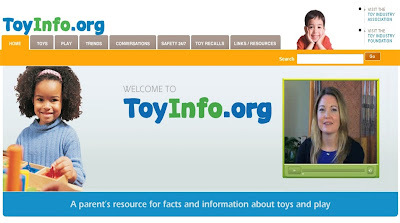 ToyInfo.org provides you with all the information you need to choose the right toys for your family. From toy safety facts to free downloadable play guides, this exciting new site is a one-stop resource for caregivers and parents to discover everything about toys and play. Videos, free downloadable play guides including a guide on Intergenerational Play, recall and safety information, discussion boards and more. Sign up for automatic recall alerts to be notified of any toy recalls. ToyAw ards.org lists the best toys of the year, as selected by toy industry experts. 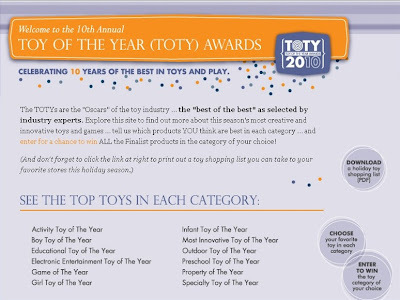 The site showcases the top toys nominated for the 2010 Toy of the Year Awards (TOTY), recognized as the “Oscars®” of the toy industry. Not only will you discover which toys the experts think are best, but for the first time, kids and parents can register for one (or more) of 11 prize packages, and can also vote for their favorite toys. Download a free gift shopping list which parents and caregivers can take along to store to help in selection the most innovative and desirable toys of the season. Showcases 81 top toys that have been nominated for the 2010 Toy of the Year Awards, recognized as the “Oscars” of the toy industry. Features a free, downloadable gift shopping list which parents and caregivers can take with them to the store to help guide them in selecting the most innovative and desirable toys this holiday season. Register to win your choice of one or more of 11 prize packages. See what the top toys are from a list of several categories including; Activity toy of the year, boy toy of the year, girl toy of the year, outdoor toy of the year, specialty toy of the year and more. I really love the ToyAwards.org site! The safety info you can get from these sites are valuable, especially with the amount of recalls we get these days. I did a post about this as well...so important o know our childrens toys are safe and it helps to know what toys are the best!